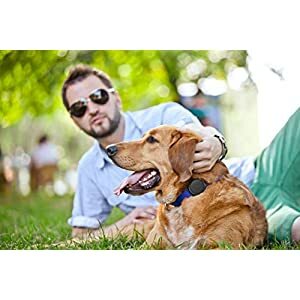 HEALTHY EARS – One of the most overlooked aspects of a dog’s health is their ears. Dogs have a keen sense of hearing primarily due to the fact that they have such a deep ear canal. This makes them more prone to ear related problems than other animals. 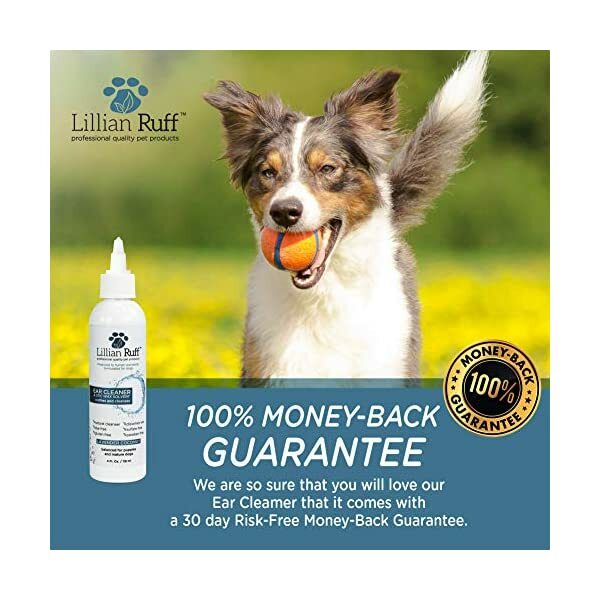 By utilizing a high quality professional dog ear cleaning solution like Lillian Ruff, you can keep your dog’s ears clean and minimize infections without worrying about damaging their ears. 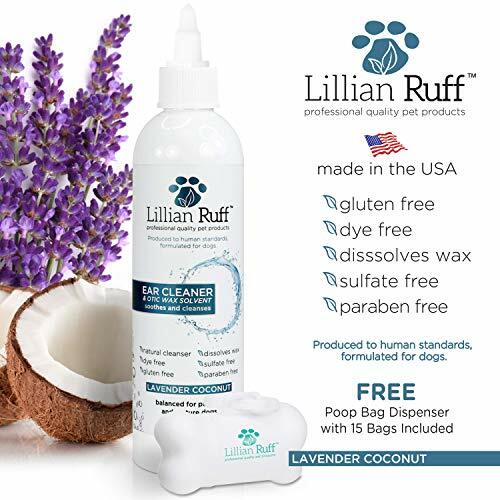 SOOTHE AND CLEANSE – Lillian Ruff ear cleaner contains a coconut derived cleaning agent, tea tree oil and bee propolis to cleanse and disinfect your pet’s ears gently. Aloe and lavender essential oils have been added for their natural calming properties for itchy, irritated skin. 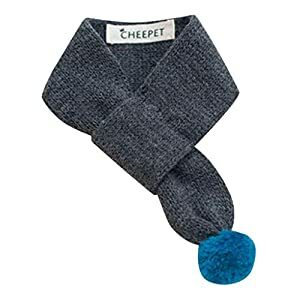 This helps with scratching and head shaking. 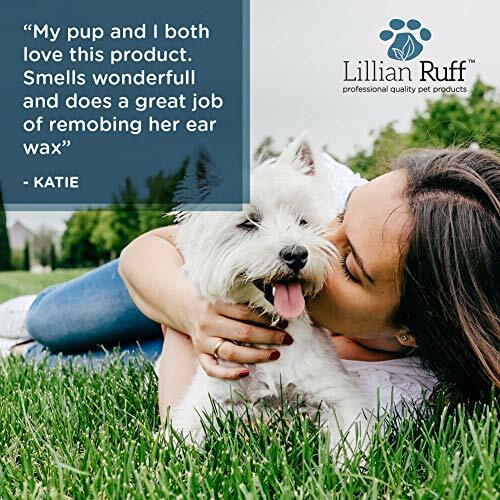 These powerful ingredients can help to prevent ear mites, dissolve wax and eliminate ear odors without stinging or burning your dog’s ears. 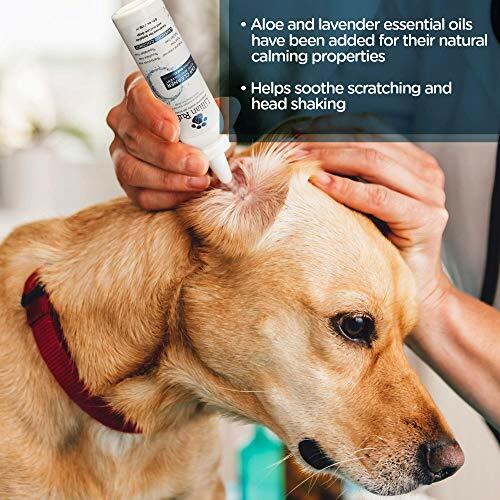 SAFE FOR ROUTINE USE – It is recommended to clean your dog’s ears at least once a week as part of their health care routine. 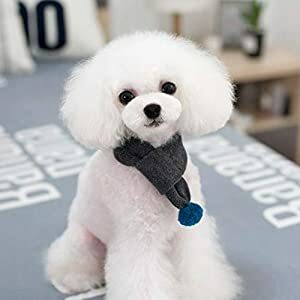 By doing this you will be able to minimize infections and ear mites. 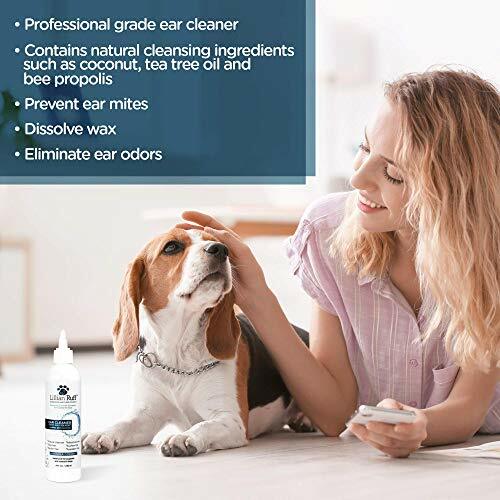 Cleaning their ears also helps minimize the accumulation of pollen, spores, dander and any other allergens that may be within their narrow ear canal that can trigger an infection further down the line. 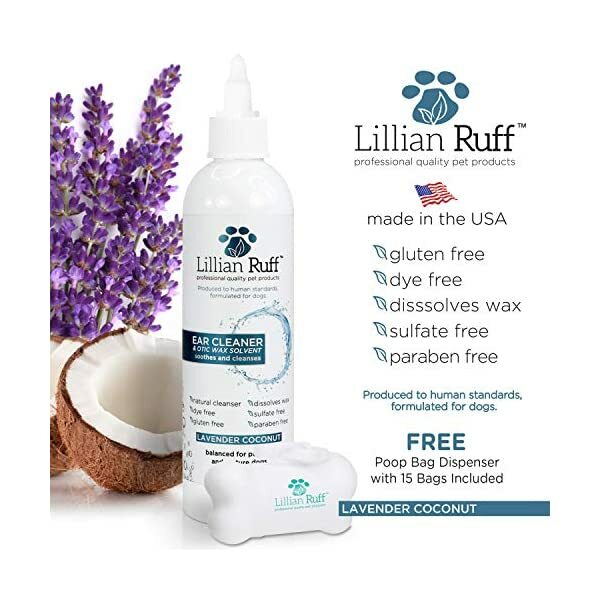 Bring your dog some relief with Lillian Ruff ear cleaner. 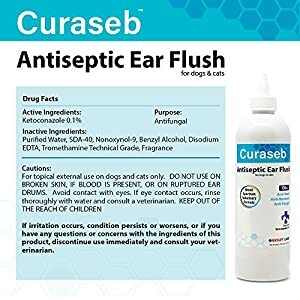 ★Important Note – Ear wash is not intended to treat any type of infections not limited to bacterial, viral, and yeast. 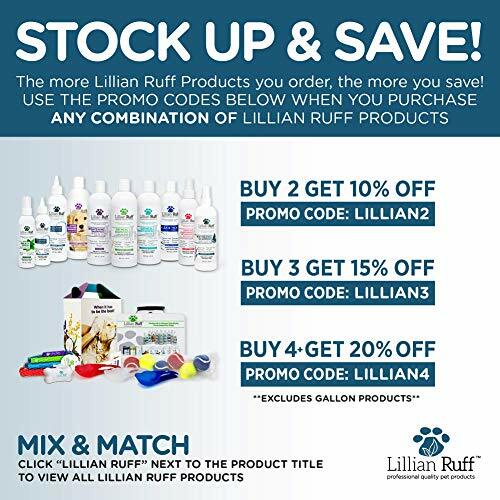 Lillian Ruff Ear Cleaner & Otic Wax Solvent is to be used for routine ear washing for wax and dirt buildup. 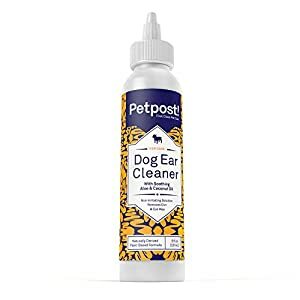 The ear cleaner should not cause any discomfort to your pet. If your pet has significant discomfort from using the wash, it is a sign of a larger problem for which you should bring your dog to a vet. Your dog’s ear health is a vital part of their healthcare routine. 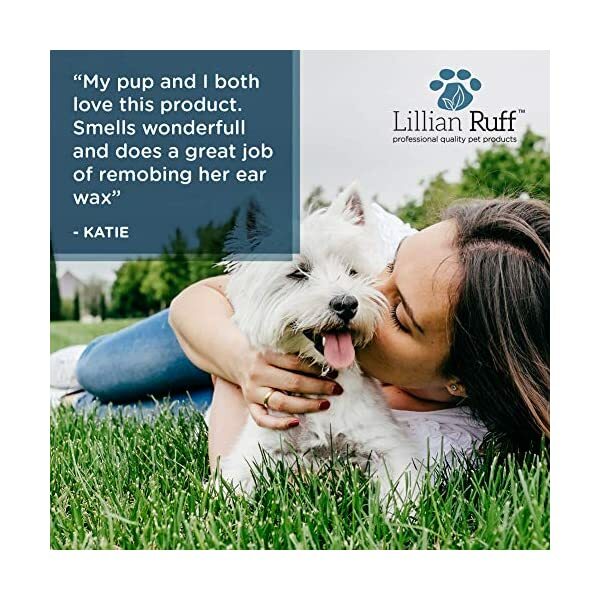 Keeping their ears clean will help to minimize the chance of infection, ear mites, allergens and significant wax build up. 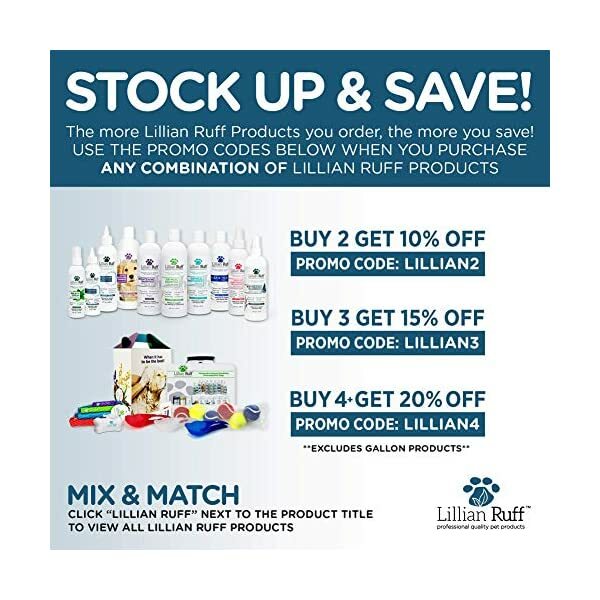 Lillian Ruff Ear Cleaner & Otic Wax Solvent will help to loosen and remove ear wax, dirt and debris. This will help reduce ear odor and soothe any itchy, uncomfortable ears. 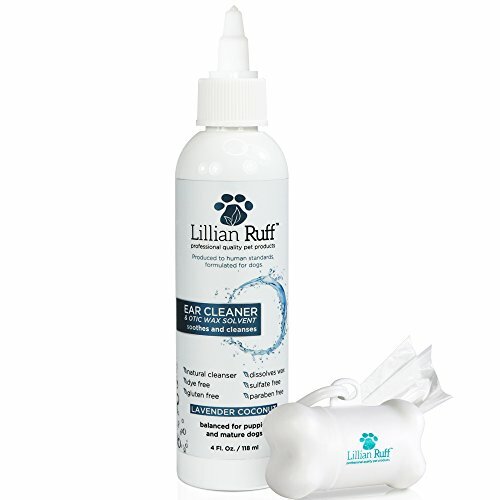 Squeeze cleaner directly into your pet’s ear canal with gentle to medium pressure. 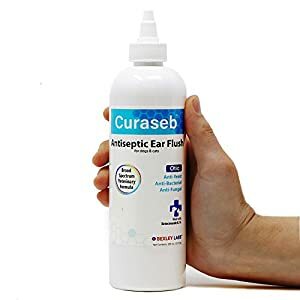 Gently massage the base of the ear for a few seconds to help work the ear cleaner into all parts of the outer canal and to help begin the breakdown of wax. Please see back of bottle for full instructions. HEALTHY EARS – One of the crucial overlooked aspects of a dog’s health is their ears. Dogs have a keen sense of hearing primarily as a result of the fact that they’ve such a deep ear canal. This makes them more prone to ear related problems than other animals. 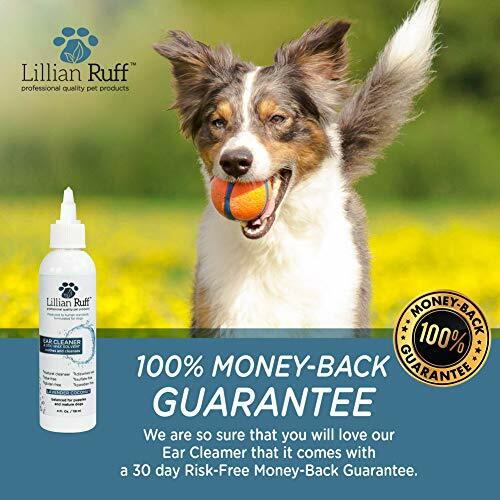 By utilizing a top quality professional dog ear cleaning solution like Lillian Ruff, you’ll be able to keep your dog’s ears clean and minimize infections without worrying about damaging their ears. 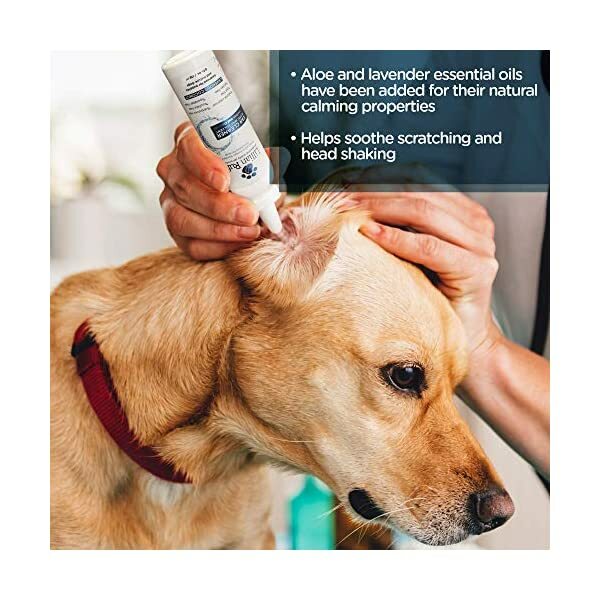 SAFE FOR ROUTINE USE – It is recommended to clean your dog’s ears at least once a week as part of their health care routine. By doing this it is possible for you to to minimize infections and ear mites. 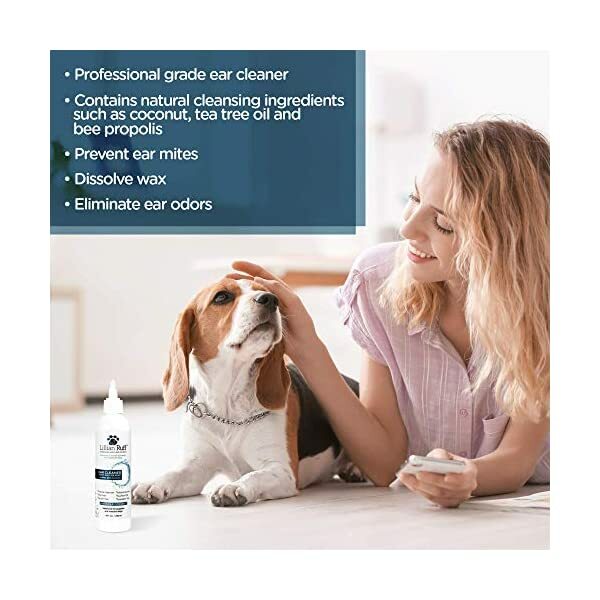 Cleaning their ears also helps minimize the accumulation of pollen, spores, dander and any other allergens that may be within their narrow ear canal that can trigger an infection further down the line. 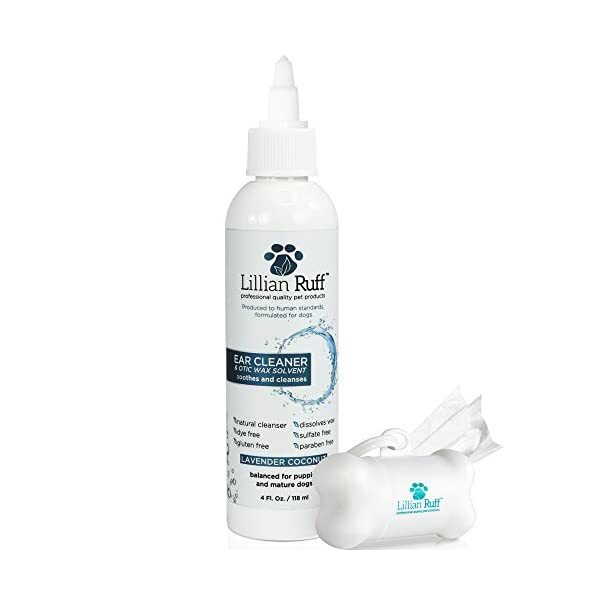 Bring your dog some relief with Lillian Ruff ear cleaner. 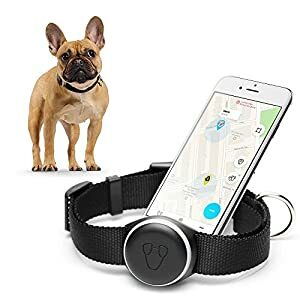 MONEY BACK GUARANTEE- We are so sure that you are going to love our product that it comes with a 30 day Risk-Free 100% money-back-guarantee. If you aren’t fully satisfied with our product, let us know and receive a full refund. 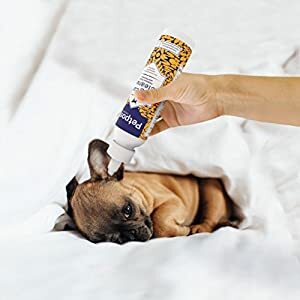 Petpost | Pet Ear Cleaner for Dogs & Cats – Natural Coconut Oil Solution for Dogs & Cats – Best Remedy for Ear Mites, Yeast and Ear Infection Causing Wax – Alcohol & Irritant Free – 8 Oz.